Released date: 12th December 2016 (Worldwide) for iPhone and Android devices. You must keep the band playing for as long you as can. The grinch doesn't like Christmas and will try to stop the band playing. But it's easy enough to stop him, just load up the app on your phone, put it in your virtual headset and shoot snowballs at him. The longer all the band plays together the higher your score. Designed with Google Cardboard SDK to work on many phones (prefer around 6"). Works on any newish phone - best for bigger phones. Just load into a Google Cardboard headset and start playing. Released date: 22nd April 2011 (US) for iPod / iPad (scaling) / iPhone devices. 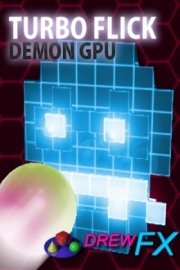 Somewhere in one of these computer memories the Demon GPU was born. Now it is in your mobile device. It will destroy your world - unless, you can defeat it first. Battle your way through 6 sectors to find it. There the Demon GPU will be waiting. Star based reward system. Can you get them all? Retro arcade style shooter blended with pinball. Release date: 22nd April 2011 (US) for iPod / iPad (scaling) / iPhone devices. Videos and screen shots will be released the same day. DrewFX Version 1.3 is now underway. See the feature set below. Pull off wave to paddle for another. Auto-land - let's you pull off the moves without worrying about landing it. DrewFX Version 1.2.1 is now available in the AppStore. For all of April $1 of every sale will go to PMH a childrens' hospital in Perth Western Australia. DrewFX Update 1.2 is nearing completion. One of the most significant changes is the camera angle, predominantly fixed behind the surfer. This removes the confusion of how to steer the player. Here's some reviews I've received about Surf Prodigy. Best surf game...this is by far the best surf game on the app store! Visually great. Can't beat the price either. Good to launch and chill out in the waiting room. Excellent game, cool graphics and great controls. Cannot wait for upgrades and new levels. This is great choice for a surf game, it's fun, low-priced and 3D so I'd recommend it to all surf fans. It's addictive. This game is awesome. Once you get used to the controls it's great. A good pre-surf warm-up. I hope it's barrelling like that tomorrow ... probably won't be. DrewFX is an emerging entertainment and game development company. 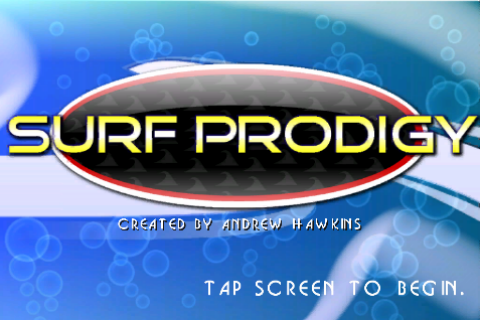 My latest game is Surf Prodigy for the iPhone. Please click on the links above for more information on my games.